The firm of Heinemann & Balestier is little remembered these days, although the Heinemann part is familiar. The publisher William Heinemann still exists at least in name, as part of Penguin Random House, and the Heinemann name lives on too through its educational publishing arm, owned by Pearson. It’s come a long way from the publishing firm founded in Covent Garden in 1890 by William Heinemann, at the age of 27. Shortly afterwards he formed a partnership with another ambitious young man, only a year or two older. Wolcott Balestier was an American writer who had come over to London in 1888 as agent of the publisher John W. Lovell. He seems by all accounts to have been a remarkable man and a very charismatic one. If his name is less remembered today, it is perhaps because he never had the time to go on and establish it in the way that Heinemann did. But in London he was quickly able to form a range of literary contacts, notably including Rudyard Kipling and Henry James. Kipling became a close friend and married Wolcott’s sister Carrie, who had come over from America to keep house for him. Wolcott was able to help Kipling with getting his works copyrighted and published in the US, overcoming the piracy of literary works that was still common at the time. Indeed his own firm John W. Lovell, publisher of Lovell’s Library, had been one of the pirates, publishing cheap reprints of English novels in the US, without authorisation. Balestier’s mission to London was in part an attempt to obtain authorisations from authors in advance of anticipated copyright agreements, much as Tauchnitz had done 50 years earlier. He seems also though to have promoted other strategies, including offering himself as a co-author to provide American copyright protection (an offer apparently refused by Mrs. Humphry Ward), or printing a small number of copies in the US to establish copyright there, in advance of the UK publication. Together Heinemann and Balestier decided to mount a challenge to the dominance of Tauchnitz in publishing continental editions in English. Throughout most of the 1870s and 1880s, Tauchnitz had faced a varying level of competition from the ‘Asher’s Collection of English Authors’. This had originally been launched by the Berlin firm of A. Asher & Co., but was later taken on by a series of other publishers including Grädener & Richter in Hamburg. Although at certain periods this had been serious competition for Tauchnitz, it had faded by the late 1880s and Tauchnitz had been left largely unchallenged. The firm of Heinemann and Balestier launched their new series, ‘The English Library’ from Leipzig itself, the home of Tauchnitz, in 1891, although the real base was probably in London. 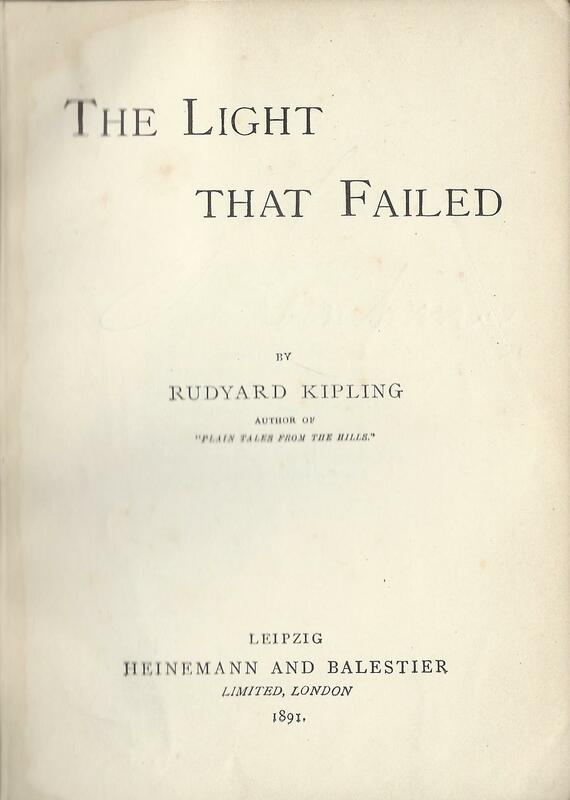 To start the series, Balestier was able to draw on his friendship with Kipling, to publish ‘The light that failed’ as volume 1, and an earlier collection of short stories, ‘The phantom rickshaw’ as volume 7. Kipling, who was at this stage only 25 himself, even younger than the two publishers, had already had one book, ‘Plain tales from the hills’, published by Tauchnitz in 1890, but had not formed the long-term relationship with Tauchnitz that many older writers had. The Irish writer Margaret Hungerford was another matter. By 1891 she was a well-established and very popular writer, who had already had over 20 books published by Tauchnitz. Two of her books appeared in the Tauchnitz series in early 1891, but her next novel, ‘April’s lady’ was published as volumes 4 and 5 of the English Library, to be followed by another five of her books over the next 2 years. She was one of the first to abandon Tauchnitz, but she was followed by many others. Given the dominant position the firm had had in English language publishing, it is hardly surprising that almost all of the writers to appear in the Heinemann & Balestier series had already had books published by Tauchnitz. Amongst the writers to defect were Rider Haggard, Hall Caine, W.D. Howells and Arthur Conan Doyle. For several, such as Florence Marryat, Mrs. Alexander, Walter Besant, Helen Mathers and Margaret Oliphant, Tauchnitz was spurned for a second time, as they had earlier had books published in the Asher’s series. Did this show an underlying dissatisfaction with Tauchnitz, or was it simply a question of money? There was perhaps an element of wishful thinking here given the number of authors who did defect, but Charlotte Yonge was one of those who remained. As when Tauchnitz had been faced with the first challenge from Asher’s Collection 20 years earlier, he responded by redoubling his efforts. From publishing around 70 volumes a year, the number published in 1891 increased to just over 100, in comparison to the 75 or so issued by Heinemann and Balestier in just the later part of the year. In 1892 the two firms were roughly level at around eighty volumes each, but the challenger was already fading. In December 1891 Wolcott Balestier had died suddenly from typhoid fever in Dresden, a week before his 30th birthday. His death probably robbed Heinemann & Balestier not only of his youthful dynamism but also of his editorial and literary contacts, although William Heinemann himself must have had considerable strengths in both areas. The publishing programme of the firm in 1892 remained a strong one, and included various works as a tribute to Balestier. 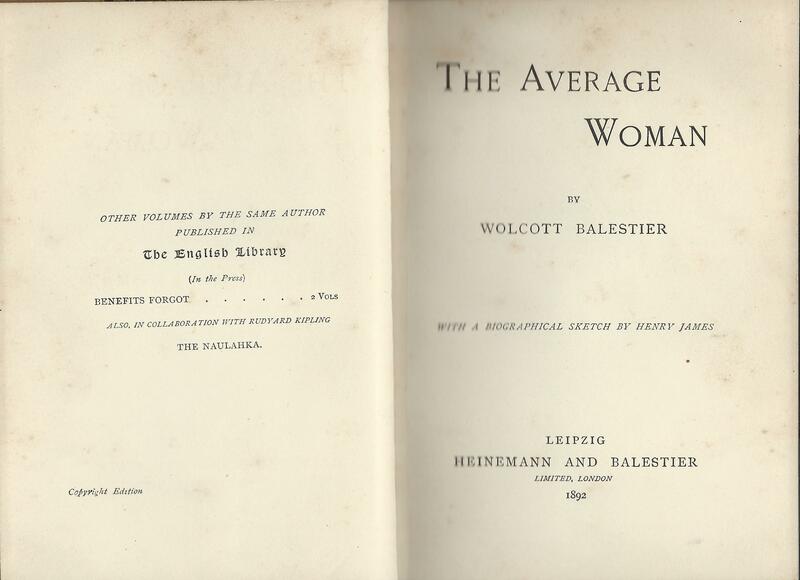 For the 100th volume in the series, they published his early work, ‘The average woman’, together with a Biographical Sketch written by Henry James. This publication also announced as ‘In the press’, two other works. Volume 150 of the series was ‘The Naulakha’ a novel on which Kipling and Balestier had collaborated, with Kipling writing scenes in India and Balestier scenes in America. The other work referred to was Balestier’s novel ‘Benefits forgot’, published posthumously in London by Heinemann and also in New York by Appleton, but I have not been able to find any evidence to confirm its appearance in the English Library. The series did though publish Kipling’s ‘Barrack-room ballads, and other verses’, which opens with a poem and a dedication to Balestier. Without Balestier, and facing a competitor as formidable and as financially strong as Tauchnitz, the challenge of The English Library could not be sustained. The volumes issued in 1893 fell to only around 20 and most of the authors returned to Tauchnitz, later including even Kipling. A smaller number of volumes were published in 1894 and then intermittently right through to at least 1903, although rarely more than 2 or 3 a year. Might it have been different if Wolcott Balestier had survived? As it turned out, it was the last great competitive challenge for Baron Tauchitz himself. By the time he too died in 1895, he could be confident of having seen off this competitor as he had so many previous competitors. He had run his firm for almost 60 years, publishing over 3000 volumes in his ‘Collection of British Authors’, and left it once again in a dominant position in the continental European market.